Long-standing limo company offers cutting-edge rides and classic conveyance throughout Long Island and NYC. 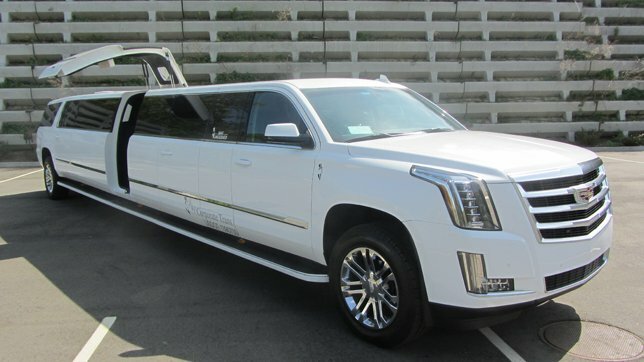 One of M&V Limo's many luxurious rides is this 2016 Escalade with marble floors. Since 1993, M&V Limousines of Commack has been offering the very finest of both modern and classic vehicles to New Yorkers looking to traverse the Island and Manhattan in style. Owner Mark Vigliante didn’t start out in the conveyance industry; when he first entered the workforce, he noted that it was in a field where thoughts of comfort and style where not the driving force behind the task at hand. “When I got out of school, I went right into the family business...my family owns a number of funeral homes. So I worked for several years as a funeral director, and during that time I purchased a black limo to use for the business,” Mark stated. The interior of an M&V limousine. M&V Limousines isn't your run-of-the-mill limo company - what sets them apart is a selection of quality limousines with attributes and quantity that their competitors can’t touch, Vigliante said. An antique car, and part of the M&V fleet. M&V Limousines isn't just all about their selection of the greatest cars of yesteryear, though - their fleet also includes numerous cutting edge, high luxury, modern models as well. Their modern vehicles feature the very latest in comfort and technology, including party buses that can comfortably fit anywhere from 25 to 55 passengers, and decked out stretch SUV limos with every amenity imaginable. A modern luxury car, and part of the M&V fleet. Another unique aspect of M&V Limousines is the fact that they are a true trailblazer in the industry; Vigliante noted that they were among the very earliest companies in the United States to adopt the new popular "stretch SUV" model of limousine, having a Lincoln Navigator altered into an 18-passenger behemoth with granite floors by a custom vehicle shop. A craze was sparked, and now these impressive specimens are commonplace, he said. The inside of one of M&V's luxury vehicles. Since the early days, Vigliante's fleet of limousines has only grown and evolved; among the vehicles he has to offer are Cadillac Escalades, Chrysler 300s, Mercedes Sprinters, and much more. Many of his vehicles feature eye-popping accoutrements including granite or marble floors, chrome ceilings, state-of-the-art lighting and music systems, touch screen controls, and phone jacks so that passengers can actually DJ with their own tunes using their smartphones. However, despite all of these perks, comfort and safety are not ignored; Vigliante notes that additional doors are typically built into his limousines to allow greater ease of access as well as serving as additional escape routes during any unforeseen emergencies. The interior of one of M&V's buses. Another point of distinction about M&V is that they are the official bus company of the Long Island Ducks Atlantic League professional baseball team, a relationship that Vigliante said began about three years ago and has proven to be quite successful for both parties. A large bus available for trips and excursions through M&V Limousines. “In addition the party buses we also have coach buses, and what we do is we transport the team on one of our coach buses to parts of New Jersey, Pennsylvania, Maryland...whenever they're on the road, we handle the bus transportation,” he said. 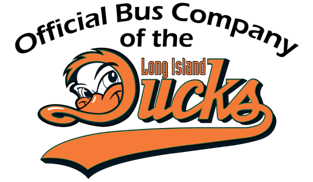 M&V Limousines is now the official bus company of the Long Island Ducks. Vigliante said that the arrangement with the Ducks has turned into a great partnership, with a new contract having been recently signed between the two organizations for 2017. In addition to the Ducks, M&V also works with numerous schools and is also one of the official bus companies for the Archdiocese of Rockville Centre. Also, starting in January, they will be having an open showcase every Monday and Tuesday evening at their Commack location for prospective customers to come on down and check out their wares. The Christmas Trolley has made the holiday season even more festive for M&V Limousines. M&V has also just recently come off of the successful launch of their new Christmas Express Trolley Ride, a festive two hour-long yuletide tour of some of Long Island's very best holiday lighting setups. “I bought a 29-passenger trolley from an auction around Christmas time, and the trolley itself was red and green, so I thought it was perfect. We dressed the trolley up with lights and everything and I had my fleet manager Josh dress up like Santa Claus to drive it, and we have an elf serving hot chocolate to the passengers and sing carols as we drive them around to check out Christmas lights,” he said. The inside of the M&V Christmas Trolley. Despite the slow climb of the national economy as a whole, many businesses are still feeling the sting in their pocketbooks; however, Vigliante noted that - despite experiencing occasional downturns in business themselves – M&V has had steady, significant growth in recent years and is going through one of their busiest periods ever. A bus available through M&V Limousines. He said that he personally feels a great sense of satisfaction when he thinks upon his many years in the limousine business, starting it back in 1993 and now boasting offices in Commack, New Hyde Park, and even Manhattan (meetings available by appointment). For M&V Limousines, the future promises continued growth and prosperity for many years to come. The interior of one of M&V's luxury buses. For more information about M&V Limousines, please visit www.mvlimo.com. Subject: LongIsland.com - Your Name sent you Article details of "M&V Limousines - Innovating Luxury Transportation on LI Since 1993"